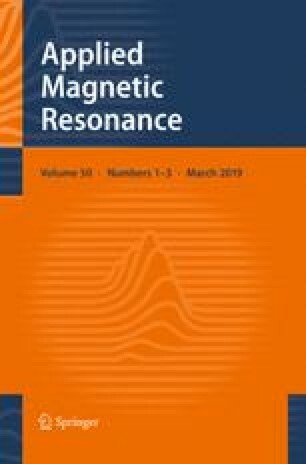 The interaction of sulfadiazine (SDZ) and its main metabolite N-acetyl-SDZ (N-ac-SDZ) with model humic acid was investigated with stable paramagnetic nitroxide spin probes. Leonardite humic acid (LHA) was mixed with laccase to enhance the amount of reactive quinone groups of LHA and then incubated with nitroxide spin-labelled analogs of SDZ and N-ac-SDZ. The labeling at the pyrimidine moiety of SDZ leaves the aniline moiety susceptible to covalent binding to LHA, which is blocked by the N-acetylation. A broadened electron spin resonance (ESR) signal was observed for SDZ, which increased immediately after incubation and indicates strong restriction of the re-orientational motion of the spin probe, i.e., immobilization due covalent binding of the aniline moiety of SDZ to reactive quinone sites of LHA. A fast first-order reaction with a time constant of 17.6 ± 3.4 h of covalent binding was determined. The broadened ESR signal of N-ac-SDZ declined immediately after incubation with LHA and is caused by unspecific sorption to LHA, not by covalent binding. Short time constants of the bound and free SDZ were found for the reduction by the antioxidant sodium ascorbate demonstrating that SDZ and N-ac-SDZ are not physically entrapped by LHA. We dedicate this paper to the memory of Prof. Dr. Kálmán Hideg, University of Pécs, whose pioneering research on synthesis of nitroxide spin labels and their application in chemistry, medicine and biophysics has inspired us all to continue his work. The online version of this article ( https://doi.org/10.1007/s00723-018-1082-2) contains supplementary material, which is available to authorized users. The study was partly financed by the Higher Education Institutional Excellence Programme of the Ministry of Human Capacities in Hungary, within the framework of the 20765-3/2018/FEKUTSTRAT Innovation for sustainable and healthy living and environment thematic programme of the University of Pécs.